Last month I had a flying visit to Amsterdam to attend the first science meeting dedicated to ESA's proposed Large Observatory for X-ray Timing (LOFT) mission. This concept has been chosen for the assessment phase of ESA's M3 "Cosmic Vision" call, and will compete with three other missions for a launch from 2020 onwards. With effective area approximately 20x that of the previous timing mission, NASA's RXTE, LOFT would provide stunning new observations of rapidly rotating neutron stars and black holes, sufficient to precisely measure neutron-star mass and radii, and also probe the spacetime close to black holes. The mission assessment is being led by researchers at MSSL (UK) and DTU Space (Denmark). I'll be contributing to the general science working group, as well as the group focussed on dense matter. Science reported this month on a planet discovered orbiting around a rotation-powered millisecond pulsar. The discovery was made by astronomers from Swinburne University, CSIRO, and several other institutions worldwide, using the Parkes Radio Telescope. Remarkably, the planet – likely the remnant of some flavour of white dwarf, possibly composed of carbon and oxygen – has a density so high, that it must be crystalline. Hence, a gigantic diamond. This was my first piece for The Conversation, a fantastic new independent site featuring news and commentary sourced from the university and research sector. Check it out! Last month I made the first in hopefully a series of observations of some neutron star binaries which are also candidate gravitational wave sources. Rapidly-rotating neutron stars will give off gravitational waves if they deviate only slightly from perfect spheres; it's possible that these waves may be detected by the Advanced-LIGO and Virgo interferometric detectors, currently being upgraded to improve their sensitivity for observations beginning a few years from now. The wave signal is smeared out by the binary orbit of the neutron star, so it's critical to measure the orbital period (and other parameters) as precisely as possible to enable to most sensitive search. 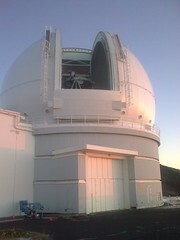 I travelled to the Roque de los Muchachos Observatory, at 2400m on top of the volcanic island of La Palma, in the Canaries, to carry out 2 nights of observing on the ING-group 4.2m William Herschel Telescope. We got spectroscopic observations of Sco X-1 over three nights, which will allow us to measure the orbital velocity of the stellar companion and improve the precision of the orbital parameters. Shakya Premachandra, whose PhD will focus on this project, is now visiting Warwick University in the UK working with collaborator Danny Steeghs to reduce the data. Had a very busy few months early in 2011, including quite a few meetings. Early in March I headed down to Philip Island for the Astronomy with Radioactivities VII meeting. Organised by Monash's own Maria Lugaro, this series of meetings brings together a wide spectrum of observers and theorists interested in various aspects of nuclear astrophysics, including thermonuclear bursts, on which I gave a review talk. A week or so later I made a flying visit to Arcadia, CA to attend the "face-to-face" weekend sessions of the joint LSC-VIRGO meeting, to talk about our optical program to improve the system parameters of candidate LMXB sources of gravitational radiation. End of March saw me in Switzerland taking part in the first of two meetings at the International Space Science Institute on the subject of thermonuclear bursts. We had a very productive meeting and set some important tasks to help us better understand our observations of these events. I presented an update on the MIN(i)BAR project. Last week I visited Milwaukee for the Gravitational Wave Physics and Astronomy workshop, hosted by UWM. This was the continuation of the venerable GWDAW series of meetings, but the format has been revised somewhat to focus more on observations and GW science than the technical aspects of detector development. For my money it was a big success, and I learned a lot about the candidate sources for LIGO and how we might follow them up with electromagnetic (optical, X-ray etc.) observations. My own presentation was on the expected instrumental capabilities in X-rays throughout the Asvanced-LIGO epoch. And, of course, I got to see the Fonz!